5/18/1954: John Walther/Miami Herald Staff -- Two car hops carrying trays of Schaefer beer. Probably shot for the Sunday, July 11, 1954 article on car hops. According to that article, "Drive-ins depend on autos for business, and a lot of auto drivers are men, and when a hungry man spots a gal clad in recklessly brief shorts and tight sweater, he'll drive blocks out of his way to stop and gape while he gobbles." 5/19/1954: John Walther/Miami Herald Staff -- Tiny Joyce Irwin has far-reaching problem. According to the adjacent article, "Then there's the case of the gangling, long-gammed carhop who always gets stuck with the ground-hugging sports cars which she waits on in a stoop-shouldered position. 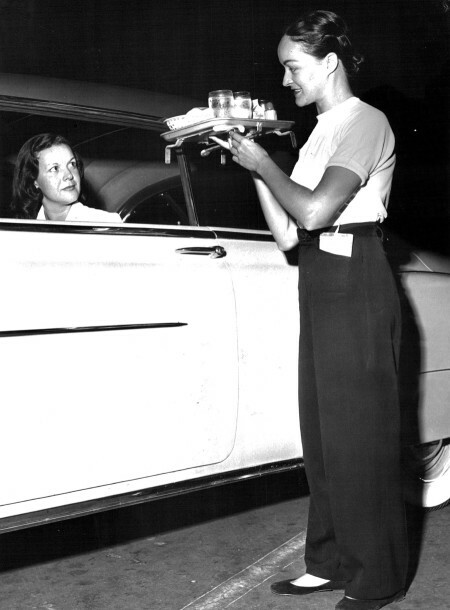 The short curb girls usually have to lift trays up to the towering window ledge of a cross-country truck." 5/18/1954: John Walther/Miami Herald Staff -- Julie Black copes with "Big Deal" Wolf. According to the adjacent article, "After suffering through his 'stick with me Baby and you'll be in pictures' line, the carhop frequently sees this character drop a miserly tip which thuds painfully on the tray." 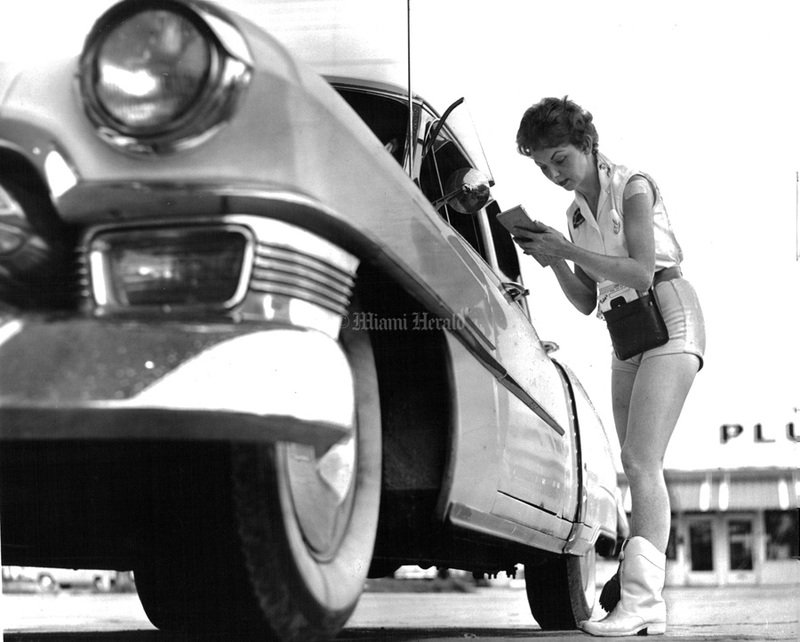 Dated 6/23/1961: Dan McCoy/Miami Herald Staff -- Car hop Bobby Johnson. Ran with a July 3, 1961 article in the For and About Women section with a darker view of the business. "...she receives no salary, must buy her own uniform, shoes and changemaker. When she works nights or weekends, she pays bus boys 50 cents to a dollar." 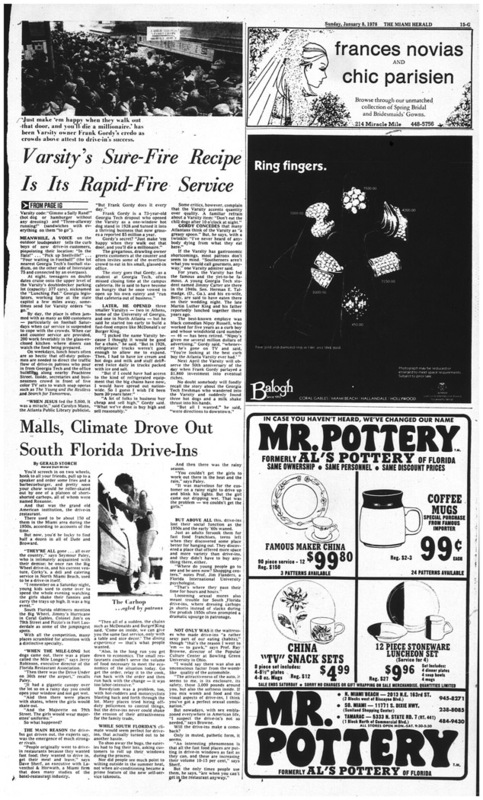 Also ran as a file photo with a January 8, 1978 story: "Malls, Climate Drove Out South Florida Drive-Ins." The article noted that running out to get the order and then deliver the food and pick up trays was not labor efficient. "Nor did people see much point to wilting outside in the summer heat, not when air-conditioning became a prime feature of the new self-service takeouts." Caption on this photo was "The Car Hop...ogled by patrons." 6/28/1952: Bill Sanders/Miami Herald Staff -- Car hop at Colonel Jim's Tasty Thrill drive in, on 79th Street Causeway in Miami Beach. Sign says "Blink Lights for Service." 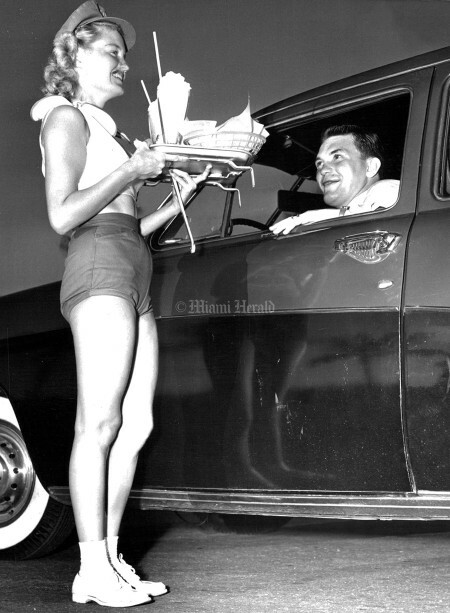 Published July 20, 1952, with caption "Drive-in...Food and cheesecake." According to the adjacent story: "The disenchanting facet of this fiendish wiggle-your-hips-and-woo-the-cars plot is that the gals know their prowess, too. In short, the smile and the cuddlesome 'howdy' is to ease the loot out of your pocket, brother." 6/28/1952: Bill Sanders/Miami Herald Staff -- Car hop Jerry Ayers serves Bob Bates from Mt. Vernon N.Y. According to the adjacent story, "Al Cooper, co-owner of a booming drive-in business in North Bay Village, has been in the food serving bonanza 20 years, but it wasn't until recently that he clearly saw the lucre-lure of shorts, shapes and shimmies. 'Business has darned near doubled,' he said." 6/28/1952: Bill Sanders/Miami Herald Staff -- Serving Barbara Lee is car hop Julienne LaVoie. 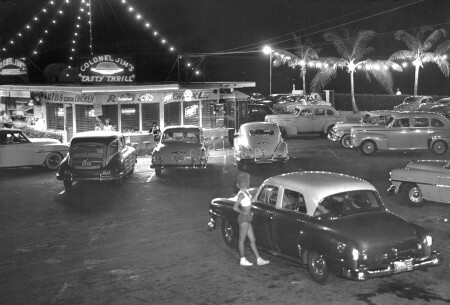 According to the adjacent story "One drive-in manager on NW 36th Street, whose gals still wear the full-length slacks, said: 'Shorts and sweaters have nothing to do with getting customers. It's a matter of food, a girl's charm and location.' There was only one car on that lot at the time, a busy Saturday night." Published July 20, 1952. Inside page of the CITY edition of The Miami Herald issue published July 20, 1954 in Miami, Florida. Features DRIVE-INS SHORT ON SLACKS!